Arthur Lovejoy analyzes a powerful if flawed concept’s “control” over Western mind since Plato. The chain of being is the continuum of “substance/essence/stuff” beginning with God (or Plato’s Good) and ending with either inorganic life or nothingness itself. The chain of being hinges around three concepts: plenitude, continuity, and gradation. At the top of the chain is pure Being. At the bottom is pure nothingness. Further, Good is coterminous with Being. Thirdly, good is self-diffusive. So far this isn’t too bad. It becomes tricky when it becomes “ontologized.” a) the line between Creator and creature is fuzzy; b) if something is lower on the chain, is it less good? What’s the difference between less good and bad? If there is an infinite distance between God and not-God, and all of this is placed on a “scale” or chain, then is there not an infinite distance between each link in the scale? This was Dr Samuel Johnson’s critique, and it highlighted the problem of the chain of being: reality had to be static and exist all at once. This called creation into question, since if the Good is necessarily self-diffusive, then it had to diffuse into creation. God had no freedom to do otherwise. Ironically, this Idea also called evolution into question: if there is an infinite distance between the links, then there is no changing from one link to another. Identifying this book is tricky. I am reviewing Herman Dooyeweerd’s Reformation and Scholasticism volume 1. Paideia Press, an otherwise outstanding publisher, has released what appears to be several volumes under similar titles. This volume only covers up to Aristotle (but not Aristotle). It is Works Series 5/1. Herman Dooyeweerd identifies four religious ground-motives in Western thought. These aren’t just “worldviews.” They go much deeper than that and control the thought-formations in a pre-conscious way. 1, 3, and 4 are dialectical and are torn by an inner dualism (Dooyeweerd 3). This ground-motive is torn between earlier nature-religions (pre-Homer) which posited a divine, eternally-flowing stream of life (5-6). It is a psychic fluid which technically isn’t material, yet it is bound to material life and is conceived materially. The best way to review this book is to highlight a number of “pressure points” within the Greek ground-motive. Pressure Point #1: What is the soul made of? The Socratic “Idea” is the life-giving principle, so it is necessarily related to the sensible cosmos; yet it is exalted above the matter principle of flux (137). For Plato Like must be known by Like–so the thinking soul must share in the immobility of the eide, and even to the eidos of “life in itself.” Why is this a problem? This would make the soul the world of ideas. But if the soul is furthered pursued on these lines, then it is “deprived of the anima rationalis of all vitality, rendering it completely inert” (154). But if the soul contains the principle of motion, is this not a move backwards towards the Elatic school and its ever-flowing physis? The nous is only the origin of the pure form, not of the chaotic elements in matter, or the chaotic motions. Thus, if the soul is the source of all motion in the cosmos (or in the microcosmos), then its simplicity is under tension. Plato alleviates this problem with a tripartite division of the soul. Pressure Point #2: Forever Apart? Dooyeweerd notes that the ontic realm of the Forms “can never be joined logically to matter…an eidos of hule is inherently contradictory” (192). He points out that if motion and rest can both be applied to Being, then there is nothing to distinguish it from temporal reality. We aren’t quite at Plato’s chorismos (sharp division) between the eternal and sensible worlds, but we are getting there. Pressure Point #3: Is Weakness Evil? In the Timeaus Plato notes that faulty conditions of the body give rise to bad decisions (Tim. 86D). In Christian terms, you sin because you are finite and created. Something just seems wrong about this. Given a Platonic anthropology, the rational part of the Soul is good but the rest of the body is subject to Ananke. Thus, man is both rational and irrational (Dooyeweerd 310). There is no denying the book’s value in its giving a minute and precise analysis of pre-Aristotelian philosophy, yet that might also be its problem. Dooyeweerd’s “Ground-Motive” schema is accurate and with it we agree 100%. And I think Dooyeweerd is successful in identifying the problems in pre-Aristotelian philosophy. Nonetheless, one often loses the forest for the trees. It is easy to get lost in the analysis and it isn’t always clear when Dooyeweerd is bringing you back to the larger picture. Yet, this book is certainly valuable for its deconstruction of Greek thought and its indirect establishing the ground for the Creation-Fall-Redemption Ground motive. Alan Scott sheds light on key problems in Hellenism by focusing on Origen’s view of the stars’ souls. Ancient Greece certainly discussed the possibility that the stars are alive (and we will use the phrase” alive,” “intelligence,” and “souls” interchangeably in this review) but there was no consensus. The presence of intelligence is the presence of a soul (Scott 9, cf. Soph. 249a4) and a mind must exist in the soul. The universe, accordingly, must be ensouled since “mind was present in it.” aether: the body in which the soul operates. The astral soul and aether co-operate. A problem for later Platonists: if the “divine” is incorporeal, and if stars are divine, how can we see them in the heavens? Jewish and Christian thinkers exploited this weak point. The only way to respond to this criticism was to weaken the “divine claim” and see them rather as intermediate beings. Scott argues against reading too much of any single school into Origen’s thought. While he is close to Middle Platonism, for example, he was also very familiar with Jewish Apocalypticism and Gnosticism (54). Philo’s sometimes wooden borrowing of philosophy allows us a “snapshot” of the Hellenistic classroom (63-64). Yet Philo rejects the somewhat Stoic claim that the mind is material. The mind is neither pneuma nor matter. Stars are definitely living beings. Not surprisingly, Philo was tolerant of those who worshipped heaven (something no biblical writer could say! ), but elsewhere says it is wrong to do so (74). “Philo is too good a Jew and too good a Platonist to take these arguments to their logical conclusions” (74). Origen advances beyond Philo in seeing the possibility of evil in heaven. Problem: how does the soul enter into the generative powers of the world? Phaedrus said because of evil, whereas Timeaus said because of a good demiurge. “The belief began to slowly evolve that the soul was joined to the body through the medium of an ‘astral body’” (77). This became a major theme in Platonism after Iamblichus (79). At this time Oriental sources entered Hellenistic thought, notably Mithraism, which taught that a gate corresponded to a planet (82). However, once the idea of fate was firmly attached to the stars, and given that people have “bad luck,” many began to question whether the stars were truly benign. This meant, among other things, that the neutral “daimons” in the heavenly realms could now be seen as demons in the traditional understanding (90-93). A common theme in later Platonic and Gnostic thought is the soul’s traveling through planets after death. The Apocalypse of Paul (Nag Hammadi Library) has Paul passing through toll collectors (98). Granted, there are huge differences between this and the later Russian Orthodox teaching of toll houses. Clement believes there are angels who oversee the souls’ ascent (106). Clement holds that stars are governed by their appointed angels (55.1; cf. p. 108). Origen divides the soul with a highest sense–mind (nous). This is fallen and capable of sin. There is an unfallen portion called “spirit” (pneuma). Origen is aware that many of his views are speculative, and he is not setting them forth as doctrine (122). He is “thinking out loud” in the face of very difficult problems. And compared to the current Alexandrian cosmology, Origen’s is quite restrained (124). This really isn’t that problematic. Scientifically wrong, to be sure, but that’s all. The problem came when Origen had to account for why some stars are greater than others. And is answer, of course, was of some pre-temporal fall. And that is problematic. Origen is actually very careful on this point. He affirms the resurrection body, but he knows, as does Paul in 1 Cor. 15, that it isn’t the same type of body we have today. But perhaps he gets in trouble with his discussions of the “astral body.” All Christians have to believe in the post-mortem existence of the soul. This is a mode of existence that isn’t bodily yet which the soul is in one place at one time. Does Scott fully vindicate Origen? Not quite, but he does alleviate a lot of problems. Origen was very reticent about using philosophy. He didn’t innovate but rather held to established, conservative opinions in the intellectual world (even if they were wrong in hindsight). Initial Problem: Can a lover be a stable friend? P1: The Lover is more dis-ordered than the non-lover. P2a: Erromenos Eros is the Supreme Desire. P3: (Socrates speaking): The non-lover has all the advantages in which the lover is deficient. Prophecy is a kind of madness, yet no one considers prophets evil (not usually). Therefore, “love” might be a madness, but it isn’t automatically evil. Here Socrates breaks the narrative and talks about the nature of the soul. The soul is immortal, which means it is indestructible and self-moving. Therefore, the soul can’t be evil. Therefore, presumably, it’s desiring isn’t madness. In fact, it has to be mad. P4*: Souls long for that which is beyond themselves . Plato introduces the famous metaphor that the soul is a charioteer. Problem: Truth is in the eternal realm, yet I am in this world of flux. How can I know truth? How can I know what I don’t yet know? Desire (Eros) mediates between what is known and what is unknown. As Socrates says, “I love, but know not what” . Thus, knowing is a form of loving. As Catherine Pickstock says, “Eros is described as a liquid, pouring into the eyes and overflowing into others” (Pickstock 239). Boersma structures his book around the (neo)Platonic movement of exitus and reditus (the departure from and return to), except exitus now refers to how the church lost the PCs and the reditus on possible steps for regaining it. It is not Boersma’s goal to defend Platonism as such. Rather, he seeks to combat the “antiheaven rhetoric among Evangelicals” (187). For Boersma–and for the earlier Tradition–Created realities point beyond themselves (carry extra dimension to them). A Sacramental world not only points to God but participates in him. The signum points to and participates in the res. The end of created being lies beyond itself (30). The Fathers were able to weave a sacramental tapestry around Christ: Christ contains the heavenly and creaturely universals in which we participate. Our particular humanity depends on the participation of humanity in Christ (51). For earlier fathers, sacred actions are performed in the church, but everyone is subject to God. God was directly working in the sacred actions. earlier theology regarded sacramental power as within the life of the church. Now it is causally top down. earlier sacramental thought held a link between heaven and earth. There was the unity of the church (res) and the sacrament to which it pointed. Berengar said we spiritually participate in the res. His opponents said we physically participate in the sacramentum. Both sides widened the gap between heaven and earth. The earlier fathers said church and Scripture coinhere. They are not two separate sources of authority. Dialectic of Wyclif: Catholics responded to him by pitting Church against Scripture. The Counter-Reformation introduced the notion of “pure nature,” which meant human nature before any prior movement of grace. Human nature is walled-off. How do we return (reditus)? Boersma examines the implications of Henri de Lubac and the Nouvelle Theologie. In their works we see a real transubstantiation, but it is when the congregation is changed into the body of Christ. This leads de Lubac to posit a threefold body: the bread, the congregation, Christ. Further, we see that sacramental time is when past, present, and future coincide (124). Chronological time thus opens up to eschatological time. Thus, “eschatological realities are able to enter into time” (125). God inserts mystery into time. Earthly events become sacraments of eschatological mysteries. Time participates in God’s eternity. The painting, or tapestry rather, was awe-inspiring. Boersma gives a convincing picture of how Platonism can be modified to serve Christianity. One can question, of course, the finer points of his readings on Scotist, but it seems more or less accurate. I picked up Jordan’s treatise rebutting Greenville Seminary’s Worship in the Presence of God. Disclaimer: I am certainly NOT advocating Jordan’s approach to worship nor really much else associated with the man. But I do think Jordan neatly summarizes the situation and points out several flaws in some (not all) RPW approaches. 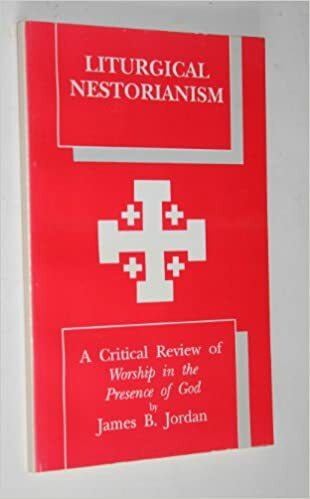 Jordan’s thesis is more or less correct: As (practical) Nestorianism is the separating the human and divine natures in Christ, leading to a diminution of the human nature, so liturgical Nestorianism means keeping the human so far away from worship that he is nothing more than a recipient who hears preaching sings (a little). The contrast in biblical is not a move from exterior to interior (this is Plato on crack) but from glory to glory. The goal is eschatological maturation, not Platonic interiorizing. Strict RPW advocates claim that a) NT worship is based on the Synagogue and not the Temple; and b) NT worship is regulated by God by direct command. Jordan points out that obvious: If this is true, then it is a meeting of silence. Nowhere does God command what goes on in the Synagogue. God simply commanded a holy convocation every Sabbath (Lev. 23). He didn’t say anything else. If something is “Fulfilled” in the New Covenant why do we normally assume that “fulfilled” means “done away with?” Isn’t this the textbook definition of dispensationalism? Mind you, I don’t think that everything should be done in the New Covenant. When God commands singing in the Bible, it is always accompanied by instruments. The 4th book of the Psalter (specifically Psalms 90-98) progresses from the arrival to the enthronement of Yahweh’s king). Music is connected with ascension and enthronement (Jordan 37). Levitical priests weren’t really mediators. There weren’t any mediators before Moses (not systematically). Levitical priests were household servants. Psalm 110 tells us who the true Mediator is in the old covenant. Only priests in union with the Melchizedekian priest-king mediate. But this is exactly what new covenant believers are (44). Can Revelation be used as an order of worship? Maybe.